Flags are meant to be a symbol of pride, but it wouldn't be a surprise if you've never seen Milwaukee's flag flying high. The current city flag is nothing to be proud of – A collage of graphics, colors, and text that breaks most rules of what a good flag should be. 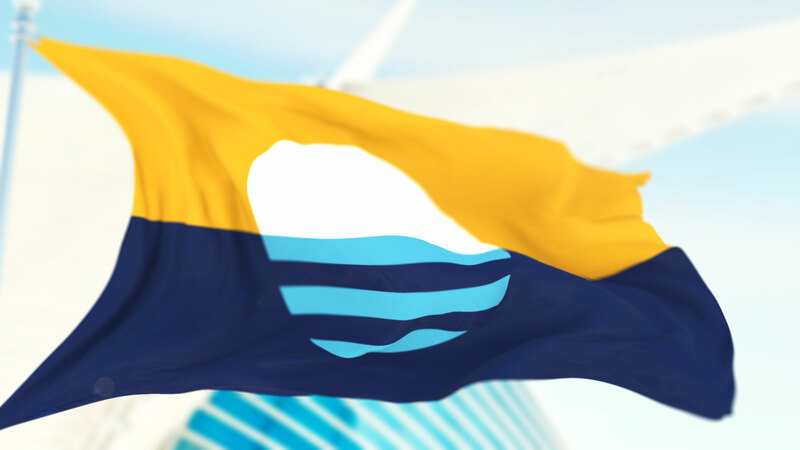 Milwaukee is a great city that deserves a truly great flag, and now is our chance to change it. On Flag Day, June 14th 2016 – after over 1000 submissions and a public vote – this flag was declared The People's Flag of Milwaukee. Milwaukee is evolving. We're not only a city of industry. We're a city of entrepreneurs, creators, and optimists. We need a flag that not only honors the past, but offers hope for the future. It should be designed to outlast all current architectural landmarks, while still providing an element of meaningful symbolism. This design utilizes bold shapes and colors to depict a visual representation of Milwaukee's most valuable asset, the lakefront. While doing so, it also contains abstract symbolism. Click the different parts of the flag below to find out more. The color gold represents wheat (or beer, if you'd prefer). The centered circle represents the sun rising over the horizon of Lake Michigan. This is the view seen in the morning, looking East over the lake, and should be instantly recognizable to any Milwaukeean. The sunrise also gives a feeling of hope, and a new day. The bottom half is broken up, representing the division between the 3 founding fathers' neighborhoods, while the top half is unified, representing their eventual agreement to incorporate as the city of Milwaukee. The color blue represents Lake Michigan and the 3 rivers (Milwaukee, Menomonee, and Kinnickinnic). Reflection of sun shows three waves/stripes representing the three founding fathers of Milwaukee (Solomon Juneau, Byron Kilbourn, and George Walker). Since moving to Milwaukee in 2007, I've gotten married, bought a house, and started a family. Every day I'm grateful that I've found a place that truly feels like home. I have so much passion for this city, and I love learning about its rich history and meeting all the wonderful people in our community. After 17 years in the design industry, I've found that much of my work is temporary, with a shelf-life of a few years at best. I'm honored that something I've created could actually have a lasting impact on the city I love so much. On June 14, 2016, Flag Day,​ ​this ﬂag was declared the​ ​People’s Flag of Milwaukee.​ Rated highest amongst ﬁve ﬁnalists​ ​determined by the public, it will hereby ﬂy as a​ ​symbol of potential and aspiration.​ It will be up to the Common Council to adopt this flag as the official city flag, so contact your alderperson to voice your support for The People's Flag. Together, we can give Milwaukee the flag it deserves!